Whosoever transgresseth (G3845 = depart, leave, be turned from), and abideth (G3306 = remain, stay, continue) not in the doctrine of Christ, hath not God. He that abideth in the doctrine of Christ, he hath both the Father and the Son. If there come any unto you, and bring not this doctrine, receive him not into your house, neither bid him God speed: For he that biddeth him God speed is partaker of his evil deeds. 2 John 1:9-11 . Even many think the ‘Emergent Church movement‘ already past, the truth is their unbiblical doctrines still continue today around the world and it has infiltrated ALL denominations. Not surprisingly there is a connection between the mysticism of the Emerging Church movement and Roman Catholic Mysticism . But also their promoters are especially targeting the younger generation. We are not trying here to accuse people, we don’t question their motives, their hearts, personal lives, characters, etc. They may be nice people or even sincere, but that doesn’t mean they may not be deceived. We just question their doctrines in light of the Scriptures, especially because our salvation depends on the true doctrine we find in the Word of God, not in the words of men. We can’t take verses out of context that’s what sects do and the reason why they are in error. Exhortation and admonition (right judgment) seek to gently correct and restore. I was a Catholic half of my life, most of my family still are, I love them, have witnessed to them and pray for their salvation, but they are not following the doctrines of the bible, the teachings of Jesus, they are following doctrines of men. It’s true that there may be some of them having revelation of who is Christ but surely they are also in their way out of that system like many of us did, please let us not forget to pray for them. Roma Downey.-‘Touched by an Angel’ star. She is a Catholic mixed with New Age beliefs, but still many evangelicals are promoting her : We will Stand , Mrs Downey has a spiritual Psychology degree from a New Age teaching institution, she admits that she is a fan of Eastern Mysticism teacher Eckhard Tolle. She practices mysticism, Catholicism, and necromancy (seeking communication with the dead). On live television, Downey communicated with her dead mother through a medium. Necromancy is strictly forbidden in the bible. She and her husband both Catholics, produced Son of God movie & the ‘Bible Series“. They are associated with many known pastors like Rick Warren , Joel Osteen, T,D.Jakes, Hillsong’s Church, Liberty University and many others, also friends with Oprah. See more here. Sadly we found that some Churches, organizations & colleges mainly belonging to the movements of Neo Calvinism, The New Apostolic Reformation (NAR) & The Word of Faith (WoF) movement, (as well as some other organizations), are in a great number getting involved with the ecumenical movement. They have links with one another, and are mostly Dominionists or ‘Kingdom Now‘ theology, which believe that it is Christians’ job to take over the world and occupy or exercise dominion, imposing a biblical rule. They said Christ would not return, until the church had claimed dominion over all of the world’s governments and institutions (7 mountains or spheres). A very admired and well known Assembly of God pastor was David Wilkerson who brought the Word of God to gangs in Bronx, N.Y., people that nobody wanted to witness to. God made many miracles in their midst. Before he passed away he gave us many warnings about the counterfeit Faith Preachers. See Video. As Peter’s doctrinal offense was public, Galatians 2:11 Paul publicly reproved him, because he was affecting others that were imitating him, and were not walking according to the truth of the gospel. 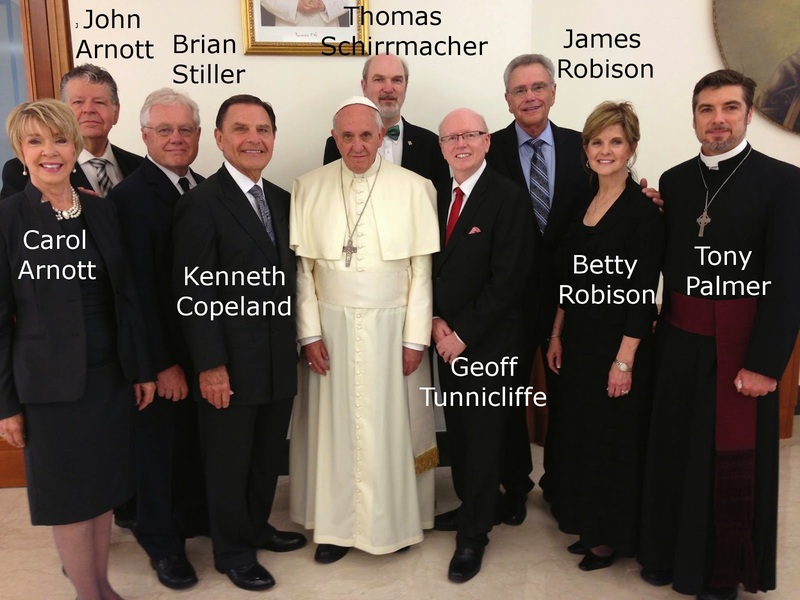 Sadly we also found that some Churches, organizations & colleges, specially the ones belonging to The Neo Calvinism , The New Apostolic Reformation (NAR) & The Word of Faith (WoF) movements (as well as some other organizations) are getting involved with this ecumenical movement, they have links with one another, and are Dominionist or ‘Kingdom Now’ theology. Many of them had been warned & rebuked by other pastors, but still continue in their ways. The most painful part is all the people they are causing to fall away from the truth of the gospel of Jesus Christ. Sound doctrine is very important to God. His word instruct us to persevere, to hold fast to the doctrine that was given to the apostles. 1 Corinthians 15:1-2, 1 Timothy 6:3-5, 2 Timothy 1:13, 2 John 1:9-11. We can avoid apostasy (departing from the faith) by learning & searching the Words inspired by the Holy Spirit (the bible), and comparing them with what we hear from others. An absence of careful examination of the words of men in the church today is leading to a great falling away from the truth of the gospel.